Have you ever tried a delicious hotel dish on your travels and wished you could recreate it at home? Us too! So, we’re going to share some recipes from our favourite foodie hideaways in a new series of blog posts. First up is this double bill of breakfast treats from Neri, who runs Berdoulat & Breakfast – an intimate Bath-based B&B with a Turkish twist, where morning feasts encompass delights from Britain and Istanbul. This simple dish is a firm family favourite. Butter a small ramekin dish. Break in 2 eggs and season thoroughly (Neri uses a combination of red, white and black ground peppercorns). Finely chop 2 sage leaves and sprinkle them on top. For a nice runny yolk, bake at 180 degrees for 10 minutes. 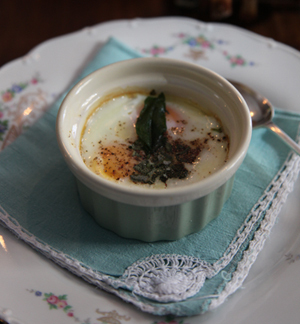 If you prefer a harder yolk, leave in the oven for a touch longer. Neri serves this zingy dish as part of the ‘Full Turkish’ breakfast offered to her B&B guests, and it’s always been very well received. 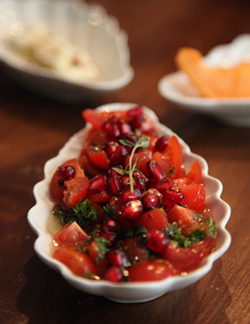 You could also serve it like a salsa alongside a tagine or various other Middle Eastern dishes. You can buy pomegranate molasses from most good supermarkets or health food shops, and it’s a good investment. Cut the cherry tomatoes in quarters. Finely chop the herbs, add some salt and mix with the tomatoes, pomegranate and olive oil. Serve on a dish of your choice, and drizzle a little of the molasses on top.